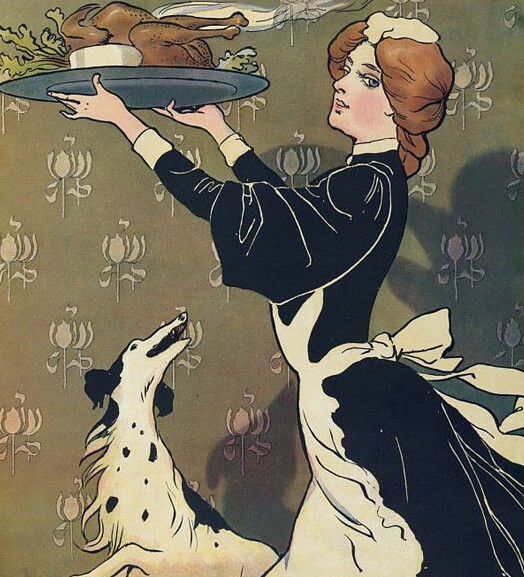 I was humbled and honored to be contacted to contribute to an article on the Smithsonian Magazine’s website about the luxurious Thanksgiving dining habits of the Gilded Age. Read When Thanksgiving Meant a Fancy Meal Out on the Town to learn more about it! For the ordinary middle class housewife of the Gilded Age, the planning and preparation of Thanksgiving was just as time-consuming and arduous as it is today. Also like today were the plethora of women’s and culinary magazines, and cooking lectures and demonstrations to bolster the housewife’s confidence in her ability to turn out a delicious and nutritious spread. The Boston Cooking School, founded in 1879, was boosted into the mainstream with the publication of The Boston Cooking School Cook-Book by its principal, Fannie Merritt Farmer, in 1896. The cookbook and the school were part of the rise of health consciousness and culinary science at the turn of the century, spearheaded by women reformers–and you can read more about that in Laura Shapiro’s fantastic book, Perfection Salad: Women and Cooking at the Turn of the Century. The following is a selection from The Boston Cooking School Magazine of Culinary Science and Domestic Economics, which was edited by Janet McKenzie Hill, another famed cookbook writer and proponent of domestic science. The selection and preparation of the food for the Thanksgiving dinner is a matter of varying interest in American households, but it is the only meal of the year that, in its general makeup, is fundamentally the same throughout the land. For the main dish of the dinner fowl of some kind is considered de rigueur. Trussing the fowl, to be baked or roasted, into a compact shape, frequent basting with hot fat, undiluted with water or similar liquid, followed by dredging with flour, and cooking—after the initial searing over—at a very moderate heat, for a proper length of time, are the main points upon which a successfully cooked fowl depends. The time of “cooking varies with the age and size of the fowl. A young ten pound turkey calls for three hours of oven heat; a chicken of about four pounds needs one hour and a half to two hours of cooking. Dry, tasteless wings, legs and second joints are the sure results of too hot an oven. As a rule cooking is carried on at too high a temperature. For bread dressing let the bread be stale; moisten with melted butter and use nothing further of a liquid character; milk, stock, water or eggs make a compact, dense dressing, not easy of digestion. Thyme is the proper sweet herb for the dressing with fowl; reserve sage for pork and geese, and sweet basil for fish. For a change try poultry seasoning—a mixture of sweet herbs and spices—put up for this special purpose. Following tradition many housekeepers wish to introduce oysters into the Thanksgiving dinner, and so add them to the dressing for the turkey. This is a mistake, for the cooking is necessarily too prolonged for anything as delicate as an oyster. It were better to present the oysters in soup or scalloped. Oyster croquettes might be essayed, but these are the work of an artist and will rarely be attempted by ordinary cooks. Egg-shirrers in the brown earthen ware, now so plentiful and inexpensive, offer an attractive means of serving scalloped oysters individually. Here, again, the crumbs should be moistened with melted butter, without the addition of water or other liquid, and the cooking should not be prolonged. Send from the oven after the family are seated at the table. If the family be large, and the turkey be carved at the table, the oysters, in individual dishes, may be put into the oven just as the turkey is taken out; they will be light, puffy, browned on top and boiling at the edges by the time the turkey, vegetables and giblet sauce are served. In some country places partridge are a possibility for the Thanksgiving dinner. The naturally dry flesh is much improved, if the birds be filled with a dressing of a largely fatty nature; salt pork, bacon or butter may supply the fat. Salt pork, chopped coarse, may be used, alone. Shake the remnants from the birds before sending to table. Cranberry sauce and cranberry jelly are given in our seasonable recipes. For occasional use one may select either, but for common, every day and day after day consumption the sauce is preferable. For jelly sugar is mixed into the hot pulp and the whole, without cooking, is turned at once into a mold to -set. For sauce, the sugar is cooked with the cranberries, and the high degree of heat, in conjunction with the acid of the berries, inverts the sugar and thus, in a measure, predigests it. In making jelly, the cooked berries are pressed through a sieve. Set the strainer—a perforated tin sheet in a tin, dipper like frame—in part of a double boiler of suitable size, then use a pestle. With these utensils the pulp is quickly and thoroughly pushed through the sieve into the boiler below; with a wire sieve and a wooden spoon only a little pulp can be pushed through the sieve, the process is laborious and, eventually, the flame is pulled from the sieve. The same thing results, when an attempt is made to secure purees of vegetables, fish or meat with these latter utensils. Every woman who makes a cream soup, even once a month, should provide herself with a wooden pestle and a proper strainer. With suitable appliances cooking is a delight, without them it is unsatisfactory drudgery and a strain on the nerves. Vegetables are largely in evidence on the Thanksgiving dinner table. All boiled vegetables should be removed from the water the instant they are cooked. Onions and vegetables of the cabbage family are more digestible, if the cooking be discontinued while the vegetables are still slightly crisp. It is, also, well for those with whom these vegetables seem to disagree, to remember that one onion or floweret of cauliflower may be eaten without inconvenience to the digestive system and even with positive advantage, when a second onion or bit of cauliflower would derange the working of the system. As a green vegetable, to serve with the turkey, neatly trimmed heads and roots (unharmed by nails) of choice celery, cut in lengthwise halves or quarters, will be enjoyed by almost everyone. If a dressed vegetable be preferred, green or red peppers, in narrow shreds, might be mixed with shredded celery. No dressing other than a simple French mixture is suitable for this occasion. Pastry in some form is usually given a place in a Thanksgiving dinner. Keep in mind that the best pastry (puff) calls for equal, weights of flour and shortening. Plain pastry is made with shortening equal to half the weight of the flour; flaky paste calls for any proportion between the two. By measure, two cups of flour or one cup of shortening equals half a pound. With these proportions in mind, one who can use a rolling pin with a light hand ought to be able to provide fair pastry for the Thanksgiving pies. Pastry may be mixed with advantage a day or two in advance, but leave the final putting together of paste and filling into pies until the day on which they are to be eaten. For pies with two crusts, let the paste, both under and upper, lie loosely on the plate, and extend one-fourth an inch beyond it. When filled brush over the edge of the lower crust with cold water and press the edge of the upper crust upon it. Do not press them down upon the plate. Pastry shrinks in baking and, when the pie is baked, the crust will be inside the plate. The matter of decoration suitable to the Thanksgiving table has been called to our attention. Fruit with autumn leaves, hop blossoms, clematis or milkweed seeds are eminently suitable for this purpose. Parsley is in its glory at this season. Some of the thick mossy varieties have a silvery look that makes them exceedingly attractive. As a border for a handsome silver tray of autumn fruits nothing could be more satisfactory and appropriate than this or any other variety of parsley. Failing this, light and dark plumes of celery would not be amiss. I didn’t realise that middle class women did their own cooking, at least for the major family dinners. If staff did all the hard work, there would be no need for cooking lectures and demonstrations to help the poor housewife in her enormous task. Ditto The Boston Cooking School would have directed its courses to the family cook, not to the housewife herself. Yep! The most a middle-class housewife would have employed was a maid-of-all-work–and frequently this maid/cook would live out and cook/clean for other housewives.